i absolutely love peanut butter. it's one of my weaknesses. i share my love of peanut butter with my dad who can eat peanut butter by the spoonful right out of the jar. like father, like daughter. i'm proud to have inherited his peanut-butter loving gene. as much as i love peanut butter, i never really thought of putting peanut butter on pancakes. i learned that trick from ryan when i met him. that husband of mine loves to spread peanut butter on top of pancakes. if we can put peanut butter on top of pancakes, why not put it inside?! peanut butter pancakes are genius. the peanut butter gives the pancakes a great flavor. they remind me a bit of peanut butter cookies (but not as sweet). 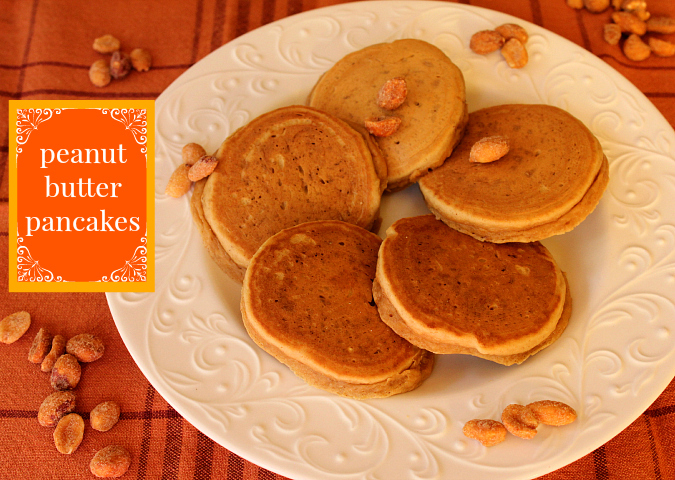 the addition of the peanut butter to the pancake batter makes the pancakes extra thick. they sure are a treat! 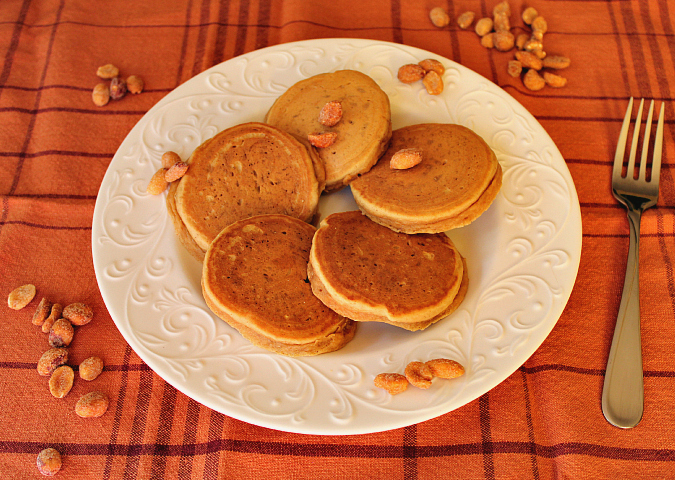 we topped our pancakes with a few honey-roasted peanuts and warm maple syrup. i bet they would be great topped with banana slices and/or chocolate chips too! in a microwave safe bowl, melt the peanut butter and the butter. whisk until smooth. whisk in the buttermilk, egg, and vanilla. add the dry ingredients and whisk until combined. heat a lightly buttered griddle or frying pan on medium heat. pour 3 tablespoons of batter onto the griddle for medium pancakes. cook for 3 minutes, until small bubbles begin to form. flip the pancakes when they start to bubble, then cook for 2-3 minutes, until they are golden brown and cooked throughout. once cooked, transfer the pancakes to a baking sheet and place in a preheated 200 degree F oven to keep warm while you cook the remaining pancake batter. serve warm with warm maple syrup. I, too, love peanut butter on pancakes, especially with a bit of syrup on top. The pancakes sound good and maybe with some chocolate chips also.